Welcome to the Acres Of Goats website! My husband, David & I have been breeding saaanens for over 20 years. Our first goats came from Joe Pilotte when he decided to sell his beautiful herd of saanens. From there it has grown to what it is today. 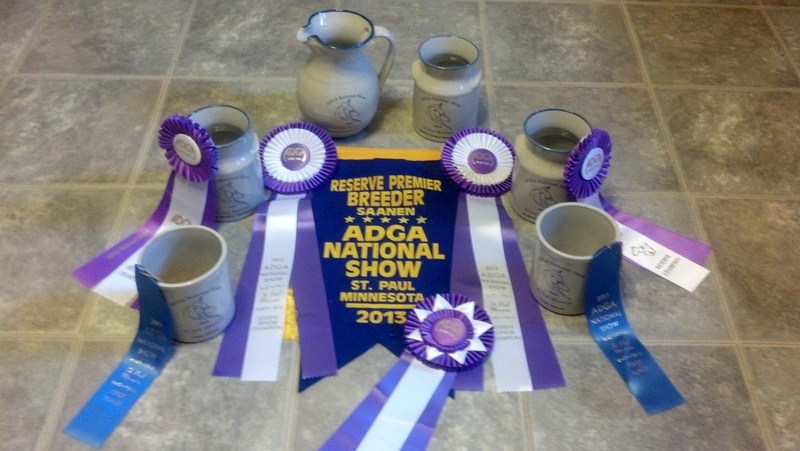 We participate in many local shows here in Indiana and in Ohio, attend the ADGA National Show when possible, have been on milk test for many years, export when available, and on the scrapie certification program - export status. Check out our site periodically. I will be adding new pictures and information as it become aviailable. It was an awesome week in Harrisburg! Four 2nd places in Jr does! Five out of 6 does were in the top ten! Then to finish up with Out Foxed being premier sire for the 2nd time and Reserve Premier Breeder. A great week in Louisville! It was truly exciting with 4 1st placings in individual classes, 1 1st place udder and 1 1st placing in a group. We ended up the week with Premier Breeder, Premier Sire and the high selling doe in the Colorama Sale. 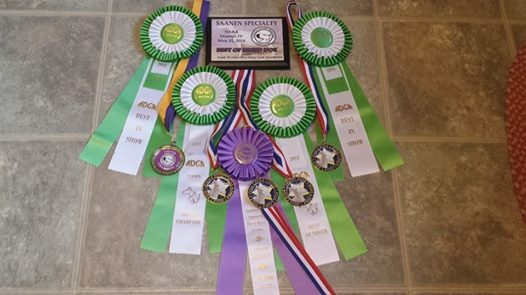 What a great day at the 2014 District IV Saanen Specialty in Hillsboro,Ohio. Darcy going GCH Sr doe, BOB & BIS, and Isadora going GCH Jr doe & BIS. What an incredible week it was in St. Paul, MN! 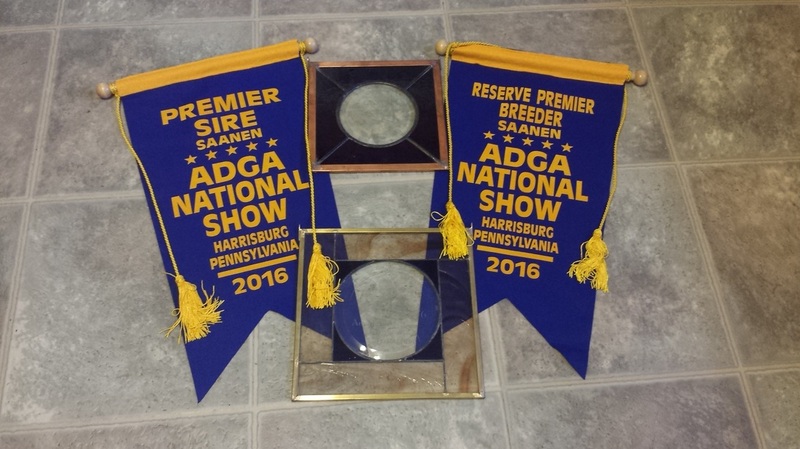 First going Saanen Reserve Jr. National Champion, then Saanen Reserve Sr. National Champion and finally Saanen Reserve Premier Breeder. It was truly a memorable experience! 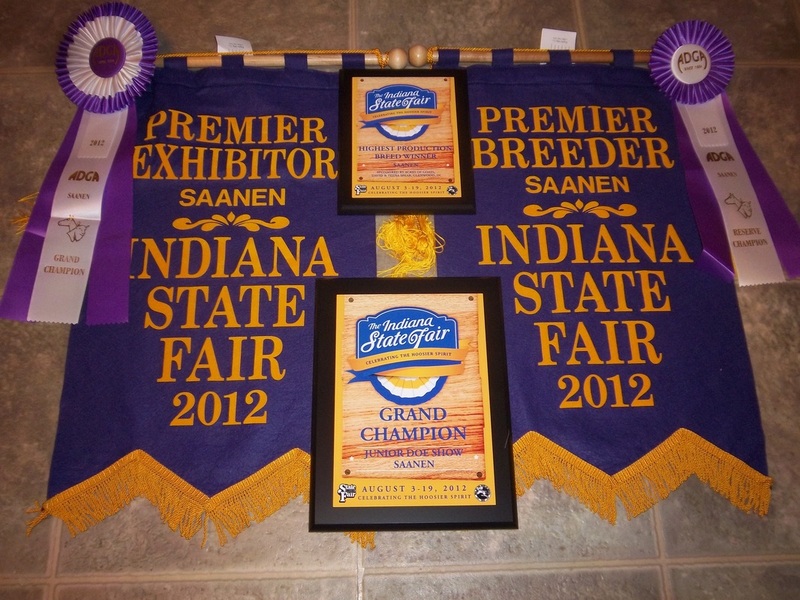 At the 2012 Indiana State Fair, we had the Saanen Jr Champion, the Saanen Reserve Sr Champion, Saanen milk production, and Saanen Premier Exhibitor and Breeder. The 2011 ADGA National Show was very special to us. 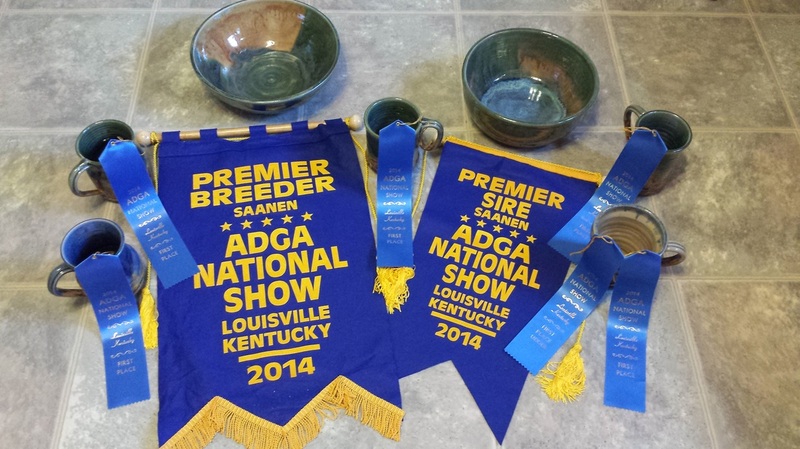 Having the Saanen Reserve Jr National Champion, 1st place Saanen Jr. Best 3 Females, 1st place Saanen Sr. Get of Sire, and Saanen Premier Breeder. Wow!